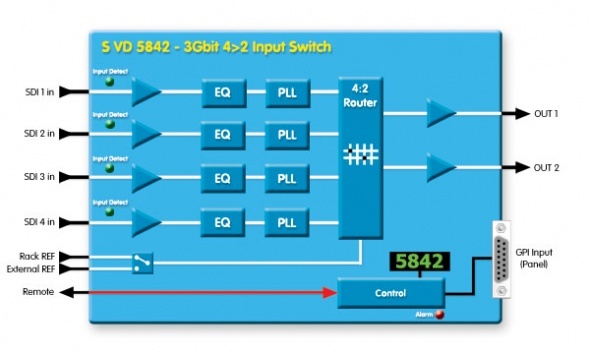 The S VD 5842 is a simple 4 channel input switch or signal router which is compatible with SDI / DVB-ASI and SMPTE 310 signals up to 3Gbits/s. This module is ideally suited for demanding multi-format broadcast and professional video applications. In reclocked mode the module will auto-detect the connected video standard. When set to non-reclocked mode the module will transparently pass data from 15Mbit/s to 3Gbit/s. The switch can be configured to switch inputs manually from the optional RCP 5082 control panel and / or from the control system GUI. For SDI signals the video is switched within the switch line of the respective video standard, so seamless switching is possible with correctly timed input signals and a reference input. Local control capability is provided via the integrated 5 digit matrix display and control switch. Remote control, status monitoring and error reporting is possible when using the LYNX control system. • Transparently pass data between 15Mbit/s and 3Gbit/s in non- reclocked mode.